Why Can Journey Be Considered as an Art Game in Terms of Aesthetics? 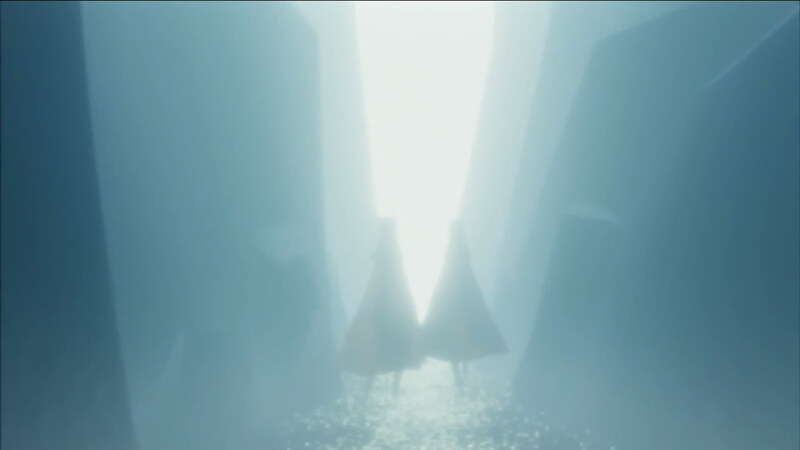 Being one of the most critically and commercially successful video games on PlayStation Network in 2012, Journey (Thatgamecompany, 2012) received mostly high critical acclaims (Metacritic, 2012) among the video games press and players for its exquisite visual and audio art style and unique the experimental gameplay experiences unified with implicit narrative which engages the player with another player through the shared emotional experiences. There are views and discussions regarding Journey as a work of interactive art (Stuart, 2012). And as the debate of whether video games can be art goes on, Journey can be a living case worthy of attention and discourses. This essay starts by justifying the feasibility of video games as a form of art and continues to argue why Journey, based on the justifications, can be considered as an art game in terms of aesthetics, in which examination and analysis on the game’s aspects of visuals, audio, gameplay and narrative are conducted and presented. It has been a controversial topic that whether video games, or more precisely, digital games, can be considered as a new form of art. There’s no doubt that video games are a form of medium with creative artistic elements such as story, visual arts and music in a similar way as they are presented in films. Although some notable figures do admit this point, they question the artistic nature of video games as they are goal and choice–driven, rule-based, and meant to be played interactively. Among these arguers, one most noticeable is film critic Roger Ebert, who at first stated in an online discussion (Ebert, 2005) that video games are works of craftsmanship that lack authorial control, inferior to film and literature and “for most gamers, video games represent a loss of those precious hours we have available to make ourselves more cultured, civilised and empathetic”. He continued to argue in an essay on the rule and goal-based nature of video games (Ebert, 2010). Other similar views were expressed by game designers Brian Moriarty (2011) and Michael Samyn (2011). Even though, these are absolute assertions which are unlikely to be proved absolute true. It is undeniable that currently most video games are not qualified as high art and they are generally commercial entertaining products of low or popular culture. However, as art itself develops and evolves, its extension is constantly expanding since it has been broadened to have literary and performing arts subsumed besides visual arts. What’s important about art is it is the artist’s creative use of skills to arouse the audience’s aesthetic sensibilities and make them feel that the work is aesthetically provoking. Other unnecessary or non-common characteristics such as entertainment, goals, rules and interactivity should not be counted as crucial factors to judge the feasibility of considering a form as art. Ernest W. Adams pointed out in a lecture at 2001 Game Developers’ Conference (Adams, 2001) that interactivity and popular culture identity do not necessarily preclude art. Instead, the total interactivity (‘ergodic’) can be utilised to make video games a special medium in conveying aesthetic experiences. To some extent, the issue of video games as art can be parallel to that of films. As an art form, it does not necessitate every film to be an artwork, nor is it true, and this also applies to video games. Hence it is not proper to make absolute assertions about these issues. As a newly risen medium, even newer than films, video games are undergoing constant evolution and full of potentials. As Ernest W. Adams argued in the same lecture (Adams, 2001), in order to be better in fulfilling the artistic nature, video games need to look beyond and act like other art forms, which means video games need a variety of aesthetics, experiments, to challenge players aesthetically more than being merely entertaining and finally, to be criticised rather than reviewed. Journey, with the theme of journey itself, has achieved Adams’ ideals about an art game in a sense. 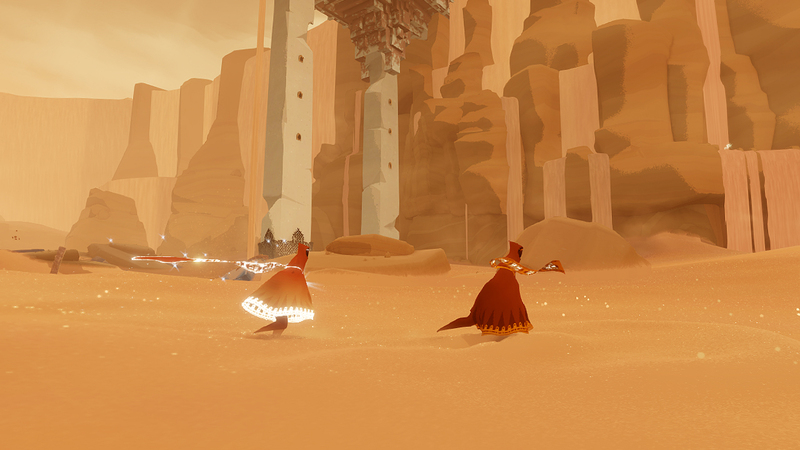 The audio-visual artistic elements in Journey were created and presented by several artists’ visions and artistry, rather than dozens’ contributions, which ensures the highly consistent art style and excellent artistic quality. In effect, they are integrated to the gameplay and narrative cohesively to create a dynamic, consistent story space for players’ immersion and emotional engagement. Overall, the game’s visual style blends illusionism and abstractionism (Järvinen, 2002) and the visuals are bonded to the narrative and gameplay tightly as they visualise the journey. On the one hand, illusionism, or fictional photorealism, is applied together with minimalistic style of background sketches in the imaginary environments throughout the journey, e.g. the vast desolate landscapes of desert, remnants buried underground of a former civilisation and the foot of the mountain where the blizzard is raging, which are depicted in vivid detailed. 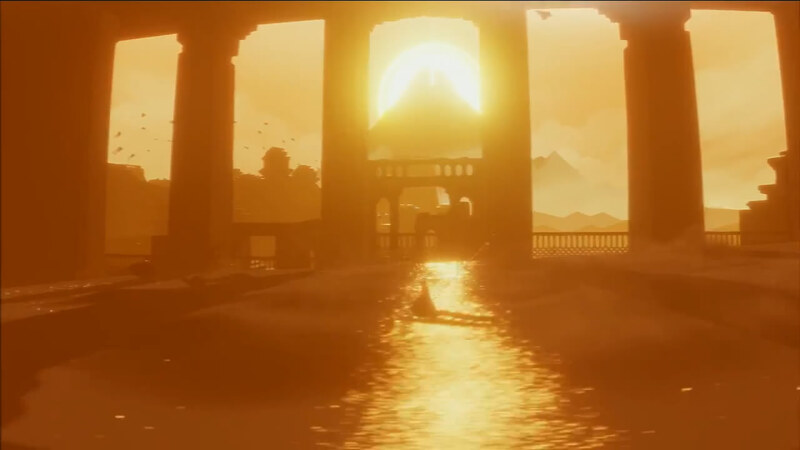 One of the most impressive scenes is where the player surfs on the flowing sand reflecting the golden sunshine along a long corridor (see Figure 1) and it is arguably a piece of artwork that is possibly only achievable through computer art. Furthermore, the creative artistry can also be seen from the visualisation of mysterious civilisation ruins which are influenced by Ancient Egyptian, Ancient Greek, Islamic and Native American architecture and decoration styles. On the other hand, characters, creatures made of cloth and the diegetic artworks in the game are generally abstract figures. The character controlled by the player is a red robed figure (in an ordinary playthrough) with neither a recognisable face nor arms, which abstracts specific details from the figure to amplify the player’s engagement and empathy with the character (McCloud, 1994: 30), so the character actually becomes the player’s avatar. Integrated with the narrative, frescos in the cut-scenes as well as those across the game world are pictured using abstract images, leaving extra space for players’ interpretations to fill in. Additionally, as the player traverses the rich game world, pervasive applications of signs (Sebeok, 2001: 9) can be seen, from the unique rune symbols used as communication signals and player identities to the symbolic metaphor of the foreboding mountain beyond (see Figure 2). Therefore, the abstractness in these visuals enriches the imagery of the game and connects it with the concreteness, creating a gestalt of visual arts. The soundscape in Journey is presented in a holistic approach of both diegetic and non-diegetic sounds (the music) (Järvinen, 2002). Standing out as the thorough audio experience, the exquisitely composed contemporary classical orchestra music is more than conventional incidental music, in the sense of music aesthetics. Through the analysis of the whole music suite, a form of themes and variations along the storyline utilised by the composer Austin Wintory can be identified, and by integrating the music into the narrative closely, the music becomes a set of “grand ballades”. As a manifestation of the integration, in the same scene of the game, music may vary according to the gameplay experienced as a single player or playing with another one. As a counterpart, the diegetic sounds feature the cooperation with gameplay and complement music in narrative. Besides the conventional functions of enhancing immersion, one most notable feature is the players’ only way of communicating by “singing” simple patterns to signal each other, in which the messages implicitly conveyed bring a sense of interactive sonic art. 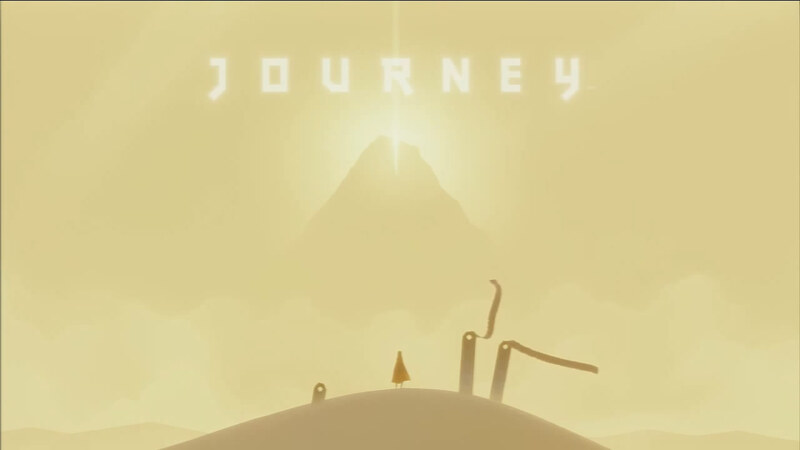 Most important of all, the visual and audio artistic elements in Journey are less functional than expressional as a result of cohesive integration with its narrative and gameplay, and thus they become more likely to be appreciated during the playing course by the player, which arguably elevates the overall aesthetic value of the game’s artworks. Journey does have gameplay (which embodies rules) and it is aesthetically experimental, so the claim that it is not a game is false. In a word, the general gameplay style of Journey can be described as “minimalistic”, using the concept of minimalism from conventional art forms of visual arts, literature, music etc. Basically, the player can only move, fly (with limited flight energy), sing (interact) and charge the flight energy by approaching objects and creatures of cloth, without experiencing explicit urgency, time limit, combats, complex character system, real death or even text displayed for reading (except for a few menu captions and the title scene (see Figure 2)). In the interactions with the unknown game world, the player explores and discovers the relations between the avatar and the world hidden from the implicit narrative and meanings of them. And at the same time the avatar grows in the flight ability as the player collects rune symbols throughout the journey with a visual feedback of the avatar’s scarf becoming longer. Since the goal of the game is directly related to the narrative and the minimalistic gameplay is also unified with the narrative (both will be elaborated later), there isn’t a typical gameplay gestalt proposed by Craig Lindley (2002), which usually creates an opposing force of experience against players’ deep immersion with the narrative. In this case, however, gameplay and narrative gestalt formation progress are fundamentally integrated as Lindley demanded for the narrative depth. In addition, the small time amount of 1.5 to 2 hours needed to play through the game limits the possible over-repetitive gameplay interactions effectively, thus ensuring the development of narrative by its intended high level structure. There comes in the more innovative experiment of the gameplay when two players share the same journey, which brings in variations to the minimalistic gameplay and the interactivity between two players. For instance, the mechanism of charging flight energy to the avatar’s scarf now can be achieved mutually by approaching to another player’s avatar (see Figure 3). As mentioned above, players can only identify each other by the unique rune symbols of their avatars, so namely the two are strangers on the same journey. Since the gameplay excludes competition, players’ inner awareness of cooperation is encouraged and stimulated instead and thus they tend to guide and help each other overcome obstacles during the journey, albeit they can only use simple singing patterns to signal. The shared journey intends to create a unique experience to the player because in each journey, the stranger he/she travels with is different. 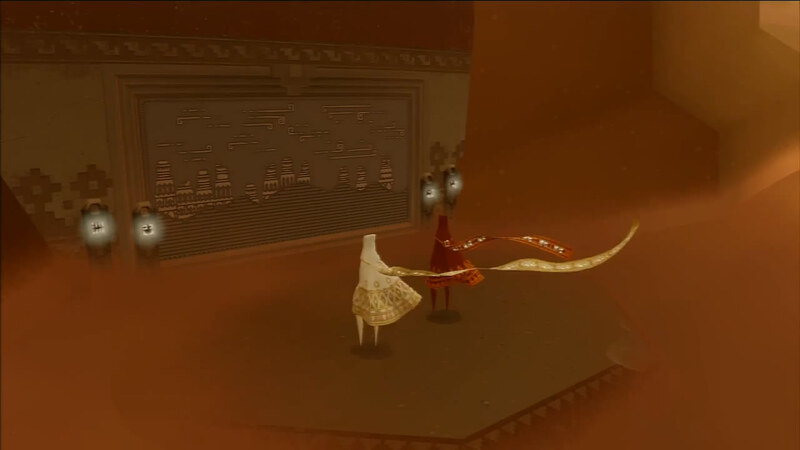 The emotional bond between two strangers in Journey can be established simply, even by the guidance offered by a player who has walked through the journey before (see Figure 4) and it deepens as the journey becomes increasingly arduous where players share their struggles and finally reach their goal of the journey. Being in accordance with the gameplay aesthetic ideal of camaraderie proposed by Sus Lundgren, Karl J. Bergström and Staffan Björk (2009), this gameplay ideal explores the “social aesthetics” of appreciating and befriending strangers through a shared emotional gaming experiences, in which explicit communications are quite impossible. The narrative of Journey is unified with the gameplay and innovatively challenges the player’ aesthetic sensibility of interpretation, emotions and empathy as a reader in an implicit and interactive way. As with the theme of journey, the narrative and the goal of Journey are also about the journey, which the player goes through by playing the game and that’s how the narrative and gameplay become unified. The journey in Journey starts in a vast desolate desert, when a shooting star flies across the dusty sky and dunes. After players climb to the top of a dune, the goal – making a journey to the mountaintop – is revealed by players themselves when the title “Journey” is revealed along with the looming image of a mountain with a glowing crevice as a strong implication (see Figure 2). For the actual narrative content, the creative director Jenova Chen adopted the basic narrative pattern of Joseph Campbell’s Monomyth and adapted it to the his own hero’s journey in the game that fits into the classic three-act restorative structure. In Journey, the three acts are about birth, trials and transformation. The creation of this high level narrative structure forms a narrative gestalt recognised by Lindley and it unifies the game experiences into the coherent narrative structure, which is required in order to experience the game as a narrative (Lindley, 2002). The narrative based on this structure is quite implicit and open, being wordless and not featuring any specific plot. In doing so, it can resonate with players from different backgrounds by an open story of the widely distributed story arc which players can relate to their familiar religious stories, folk tales and myths, so the narrative can be interpreted variously through universal understandings and emotions. When the journey comes to the third act of transformation, the narrative progresses to the climax as the avatar transforms from the rebirth and ascends to the mountain and it culminates in the avatar ‘s walking (maybe with another stranger) into the white light of Eucatastrophe (Tolkien, 2001: 68) rendered by cinematic techniques of slow motion and fading out into the pure white screen and the lingering music which intend to bring a catharsis to the player (see Figure 5). As the journey ends, the player is taken on a reversed tour of the journey with a shooting star of rune symbols through the credits ending scene. When the shooting star finally flies across the same dune once again, the cycle of birth, trails and transformation ends and is ready to begin again. The connotation of the shooting star now may have a personal interpretation in the player’s mind. Notably, the narration in the game is quite implicit as well because of the wordless feature of the game, so the narration is not approached in a conventional literary way, but in two other ways instead. One is the pre-set narrative of audio-visual cut-scenes in which dynamic frescos of abstract images and animations show the brief history of the once-thrived civilisation and the retrospection of the player’s journey (see Figure 6). The avatar’s non-verbal communication with the noble white robed figure in the cut-scenes also leaves space for player interpretation. 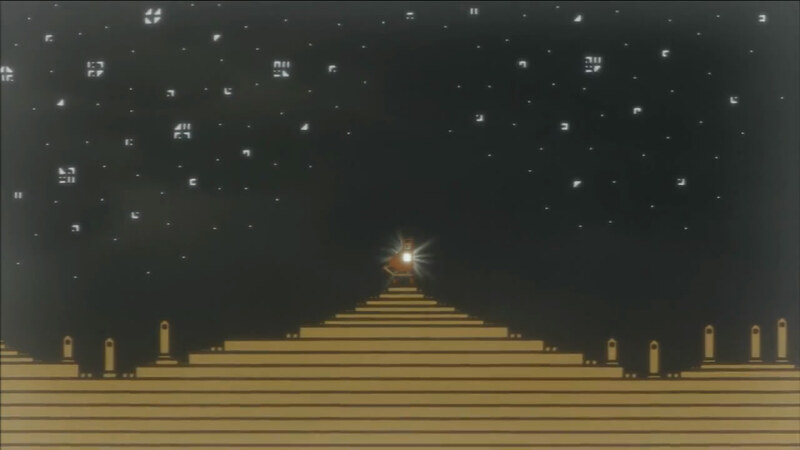 Meanwhile, the image of the mountain constantly appears in the cut-scenes, prompting the goal. In this way, the game assumes its authorial control and delivers the less interactive part of the narrative. The other way “gameplay storytelling” is the actual unification of the player’s interactive gameplay and narrative, through which the player explores the audio-visual game world and discovers the relations between the avatar and the world as the avatar grows. It can be called gameplay storytelling because, in fact, the gameplay process is almost seamlessly synchronous with the process of narrative in this game as the narrative of the journey is enacted by the gameplay, i.e. the player’s active fulfilment of the journey, while the player, in turn, experiences his/her own journey story through the gameplay. To create preconditions for an immersive narrative experience (Jenkins, 2004: 123) in this approach of narration, environmental storytelling is widely applied throughout the journey and it achieves well because of the positive effect of the minimalistic gameplay on narrative depth as argued earlier. The environments impact on the gameplay both passively and actively. The tomb stones the player comes across, the frescos relics the player discovers (see Figure 4), the trapped cloth creatures the player saves from the remains of “stone serpents” (the passive impact of environment on the gameplay) and the player’s progress in the storm with struggles (the active impact of environment on the gameplay), to name a few, all present the player with extra stories that need contextual cogitation and interpretation. Arguably, the gameplay storytelling strengthens the player’s empathy with the avatar and the appreciation of the narrative as a gestalt. Conclusively, as a result of the gameplay storytelling, the gameplay functions to convey the narrative throughout the journey – the whole interactive game experience. The unification of gameplay and narrative makes the latter a seamless interactive story, thus neglecting the inherent conflict between the interactivity and the narrative noted by Jesper Juul (2001) and his negative judgement on “continuously interactive story”. This interactive story is about the hero’s journey of the player (maybe with another stranger), which possesses a relatively timeless aesthetic meaning that can be appreciated universally without languages. This is Journey, an unparalleled art game. Observably, it has visual and audio art elements of high quality which are integrated with the gameplay and narrative, engaging players in an unknown mysterious world for an aesthetically intriguing journey of life. Its experimental gameplay explores gameplay aesthetics of minimalism and camaraderie, encouraging players to cooperate and establish emotional bond with strangers, rather than compete with each other for mere pleasure and satisfactions. The implicit and interactive narrative challenges players aesthetically by engaging players with a hero’s journey that opens to interpretations and can be shared and appreciated universally without languages. The unified game, as a gestalt, intends to convey a unique gaming experience of exploring life’s cycle and transcendence with crossings and intersections of our lives between each other. Therefore, an answer has been given to the question why Journey can be considered as an art game as Journey fulfilled Ernest W. Adams’ ideals about art games and advances to be a living proof of the evolution of video games. There’s no reason not to have faith in a wider recognition of video games as art because on this journey, Journey is not alone. Adams, E.W. (2001) Will Computer Games Ever Be a Legitimate Art Form?, [Online], Available: http://www.designersnotebook.com/Lectures/ArtForm/artform.htm# [31 Dec 2012]. Ebert, R. (2005) Why did the chicken cross the genders?, [Online], Available: http://rogerebert.suntimes.com/apps/pbcs.dll/section?category=ANSWERMAN&date=20051127 [27 Dec 2012]. Ebert, R. (2010) Video games can never be art, [Online], Available: http://blogs.suntimes.com/ebert/2010/04/video_games_can_never_be_art.html [27 Dec 2012]. Järvinen, A. (2002) ‘Gran Stylissimo: The Audiovisual Elements and Styles in Computer and Video Games’, Computer Games and Digital Cultures Conference Proceedings, Tampere, 113-128. Jenkins, H. (2004) ‘Game Design as Narrative Architecture’, in Wardrip-Fruin, N. and Harrigan, P. (ed.) Fisrt Person: New Media as Story, Performance and Game, Cambridge, Mass. ; London: The MIT Press, pp.118-130. Juul, J. (2001) Games Studies 0101: Games telling Stories?, [Online], Available: http://www.gamestudies.org/0101/juul-gts/ [07 Jan 2013]. Lindley, C.A. (2002) ‘The Gameplay Gestalt, Narrative, and Interactive Stroytelling’, Computer Games and Digital Cultures Conference Proceedings, Tampere, 203-215. Lundgren, S., Bergström K. J. and Björk, S. (2009) ‘Exploring Aesthetic Ideals of Gameplay’, Breaking New Ground: Innovation in Games, Play, Practice and Theory: Proceedings of the 2009 Digital Games Research Association Conference, London. McCloud, S. (1994) Understanding Comics: The Invisible Art, New York: HarperPerennial. Metacritic (2012) Journey for PlayStation 3 Reviews, Ratings, Credits, and More – Metacritic, [Online], Available: http://www.metacritic.com/game/playstation-3/journey [29 Dec 2012]. Moriarty, B. (2011) An Apology for Roger Ebert, [Online], Available: http://www.ludix.com/moriarty/apology.html [28 Dec 2012]. Samyn, M. (2011) Almost Art, [Online], Available: http://www.escapistmagazine.com/articles/view/issues/issue_291/8608-Almost-Art [28 Dec 2012]. Sebeok, T.A. (2001) Signs: An Introduction to Semiotics, 2nd edition, Torronto: University of Toronto Press. Stuart, K. (2012) Is Journey a game or a piece of interactive art?, [Online], Available: http://www.guardian.co.uk/technology/gamesblog/2012/mar/15/journey-game-or-interactive-art [29 Dec 2012]. Thatgamecompany (2012) Journey, Sony Computer Entertainmen. Tolkien, J.R.R. (2001) ‘On Fairy-Stories’, in Tolkien, J.R.R. Tree and Leaf, London: HapperCollins, pp.3-81. Thatgamecompany is an independent video game developer which consists of eleven members by now. Monomyth, or the Hero’s Journey, is a basic narrative pattern summarised by comparative mythologist Joseph Campbell in The Hero with a Thousand Faces, in which he proposed that numerous myths from disparate times and regions share fundamental structures and stages. Eucatastrophe is a term coined by J. R. R. Tolkien to refer to the sudden and happy ending in fairy-stories which is the opposite to the tragedy in dramas. This entry was posted in Writtings and tagged Theory.